I'm still confused by the exact point of these "remember love" posts, so I will not write them. I guess it's about what you like about your anime? Why do you love it? Why you chose it over the thousands of anime out there? It's fun to watch those two bickering at each other. They are both childish at best which is why they fit each other despite their polar opposite personalities. They simply don't notice how much they both enjoy the company of each other. I mean - that setup was like Taiga and Ryuuji, and who ended up together? 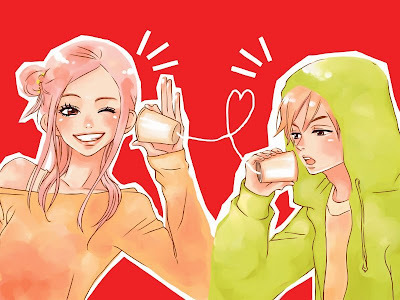 My friend suggested Lovely Complex to me when I said I wanted to try to get into shoujo but it's hard diving into a genre you're not used to lol. But now I think I'll try it *_* It's so cute how you're strong willed and bitchy haha what a badass! believe me, I am not a fan of shoujo either but this one is definitely an exception. Contrast between two characters always produce really excellent results, especially if it's a male and female in a shoujo/romance show. I haven't watch this anime yet but perhaps I will try it soon enough.